We just got back from a driving trip with 10 days in 10 states, although three of those were merely cutting corners across them (MO and AS to get to Memphis; GA between Talahassee and Montgomery). Our itinerary seems odd, until you realize that we're trying to collect state capitols (photos of us in front of, we're not stealing cities). Some of the recs come from here, some from Trip Advisor or other sites. I'm certain we didn't always choose the most wisely, but never had a meal worse than "that was perfectly acceptable" and usually a lot better. One of our lacks of wisdom is not going out for breakfast and lunch often: We drive with a crate of snacks and peanut butter, and cooler of cheese and salami, hummos and carrot sticks. Between that and motel free breakfast, we splurged a lot on dinners. Memphis: Central BBQ is quite nice. We got a sampler platter of pulled pork, sausage and ribs, and half orders of the nachos platter with their pulled pork, and a half order of "wet" wings. Ribs were very good, easily torn (but not jello). Pulled pork had a good smoke to it, but the sausage left something to be desired, more like kielbasa, not as smoky or tasty as the ones I've had in Texas. The wings came out late and made a spicy dessert, nicely hot, very big and meaty, with crisp fried skin over smoke. The nachos were not my favorite. Reviews advised getting them with their house-made potato chips instead of corn chips, but it ended up very salty. Side of mac 'n' cheese was quite good, side of pork rinds with their rub sprinkled on them was even better. The next day we went through Clarksdale MS. 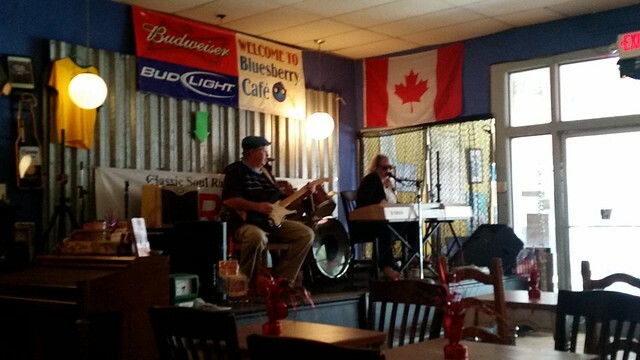 Some musicians were setting up in the Bluesberry cafe around 11AM, so we sat a while, made an exception to our breakfast/lunch rule. Good coffee, OK pancakes, poor fried green tomatoes. Jackson MS is a bit of a wasteland: there are vacant lots or buildings torn down except for the facades just blocks from the state capitol. However, Manship (named after a nearby estate), was probably the best food we had on the trip, on the order of an Innovasi or Vie with most dishes fired in a wood oven. We started with a Bramble for me (sweeter than I expected, but quite a nice drink) and a wine of forgotten vintage for SueF, a quite nice red. 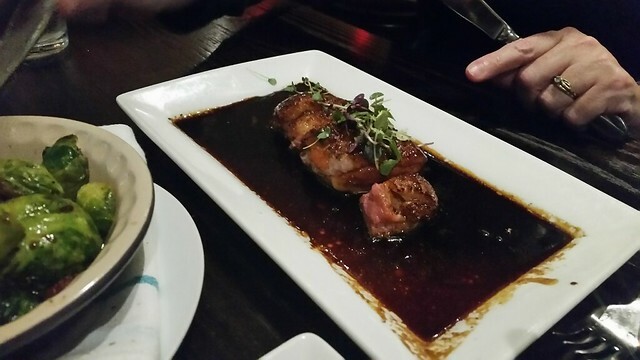 We had a pork belly app that we forgot to photograph. Sorry. Absolutely fantastic though. 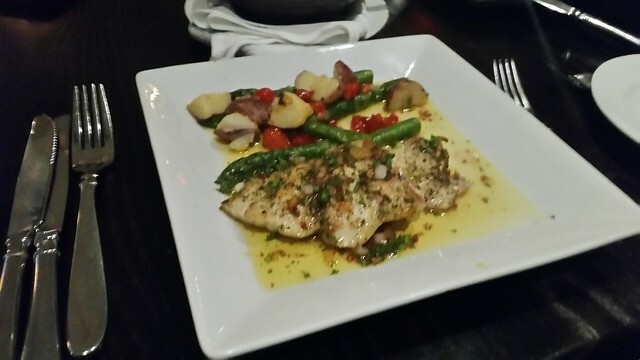 I had an outstanding "greek-style" grouper with preserved lemon and peppadews peppers, Sue had duck breast. Both were outstanding. 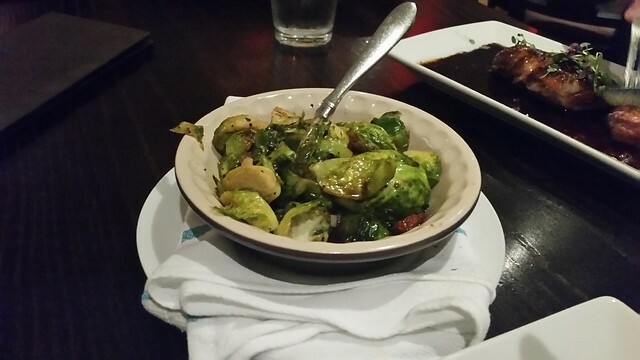 The side of brussels sprouts was the only miss: a little on the raw side -- some blistering char would have helped a lot. 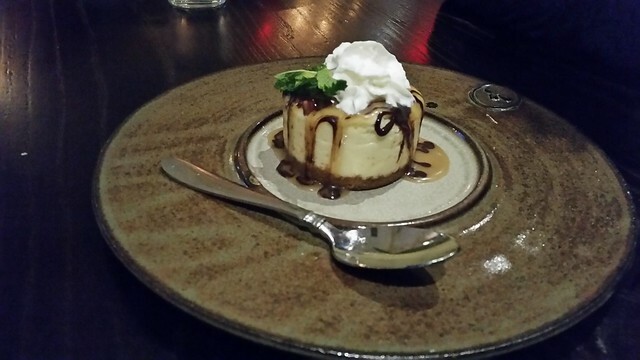 We'd had some trouble getting our drinks, so the management comped us dessert - a very nice praline cheesecake. The cheesecake itself was barely sweet, letting the toppings carry that weight. I don't know if you'll ever have a reason to go to Jackson, but if you do, seek out Manship. The following night we got to New Orleans and decided to wander down Bourbon St and surrounding until something caught our eye. Initially thinking of something un-fancy, we got turned off by the endless repetitions of the same Willy's Fried Chicken and shops hawking po-boys, then stumbled into the Court of Two Sisters. We both had their prix fixe menu. This was my night for shrimp: BBQ Shrimp as an appetizer, Shrimp and Grits for main. Sue had the gumbo and the veal oscar (topped with shrimp and crab). Everything was delicious: the BBQ shrimp was different from others I've had, closer to the deep spicy roux of an etouffee. My only gripe was that there were actually more shrimp in the app than the entree (probably balanced by the grits, andouille, etc., but still). Desserts of pecan pie and bread pudding. 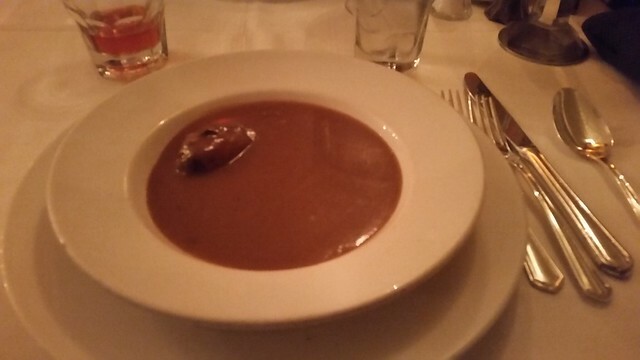 The whiskey sauce was the best part of the bread pudding. The pecan pie was not as good as Sue's (but what is? ), but very tasty, with a cookie-like crust. 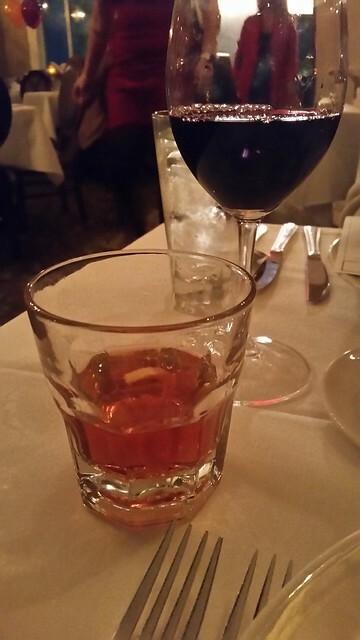 This evening featured my first (but not last) Sazerac. Sorry, no pix. The following day was another rare exception to the breakfast rule - we played tourist and got coffee and beignets at Cafe Du Monde. I thought I had pix, but evidently not. Be prepared for absurd amounts of powdered sugar -- don't dress in black, and if you sweeten your coffee, the bottom of the bag will certainly be adequate. And then some. After a breakfast of basically sugar, I needed something a little more solid, and we stopped to listen to some jazz and grab a po-boy at Cafe Beignet. Very disappointing: nothing but the fried shrimp, lettuce and awful tomato, lousy bread. We saw their "muffaletta" go by and it resembled something from Subway. Come for the music, don't stay for the food. Dinner was the only reservation we made the whole trip: Commander's Palace. Note that the Lafayette cemetery across the street closes at 3:30 PM, so it's not a good fit for a pre- or post-dinner tour. The reputation of this place is well deserved: fine, classical service starting with a veritable army of staff you're walked past on the way to the table. Pix aren't great: they're from my phone without flash, probably need some white balance. I had another sazerac - more botanical than Two Sisters' version, and I think stronger (hard to imagine for a drink that's basically a big glass of rye). Sue's wine is a Cab from Pays d'Oc. 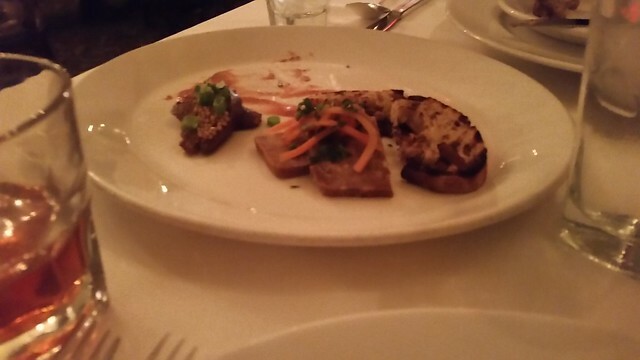 The Butcher Block plate made a very nice starter, and showed off some pretty cool charcuterie chops: Antelope chorizo, oxtail terrine, and a chicken liver mousse that escaped photographing. 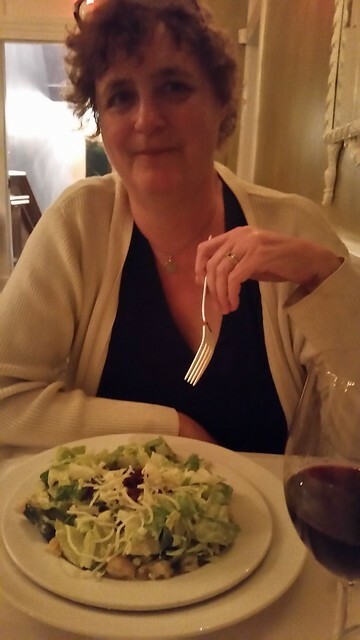 Sue started with a romaine, gruyere, shredded egg and bacon salad, which was sort of a nice French riff on a caesar. 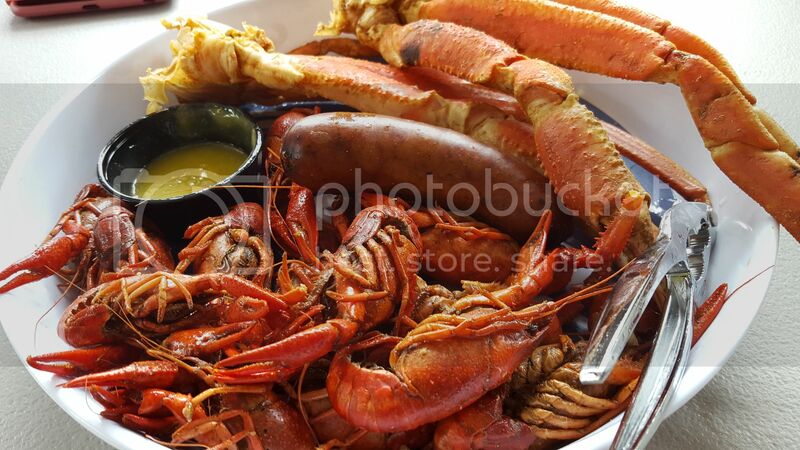 I had the crawfish bisque, which included a mudbug head stuffed with breadcrumbs, crawfish and other things -- messy to eat, but very tasty, rich and spicy. 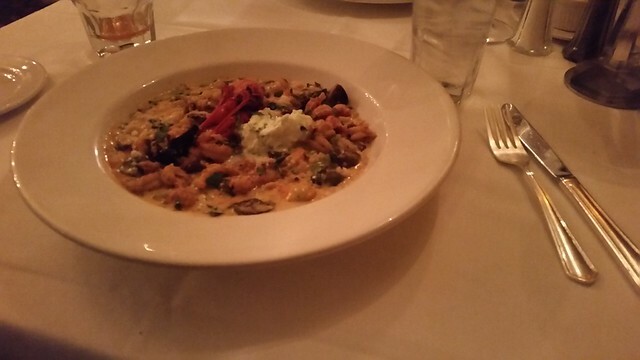 Staying with the crawfish riff, I had the crawfish risotto. Lots of tails among the perfectly wet rice, good spice and very very filling, with a dollop of saffron chantilly. 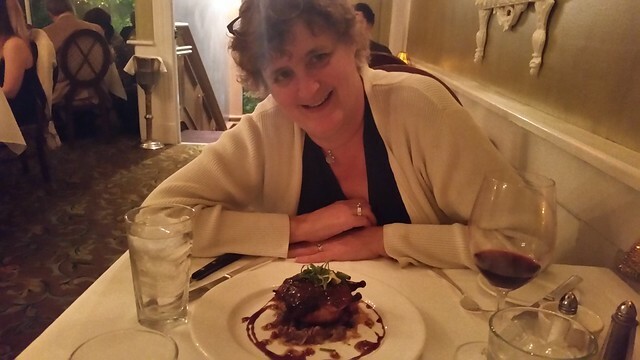 Sue had the chicory-lacquered quail, the best taste of the night. Crispy skin, rich meat, perfectly seasoned. 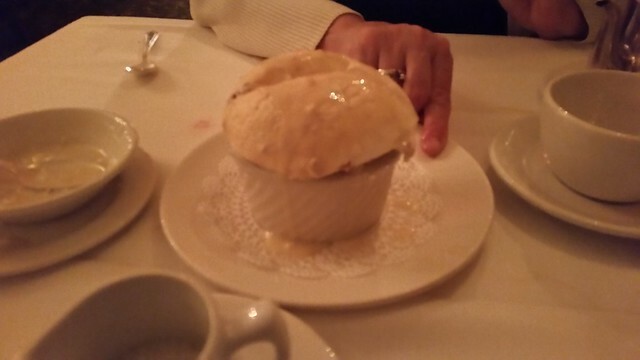 Their signature bread pudding souffle is a bit of a puzzlement: too heavy for a souffle, too light for bread pudding. I think we'd have been happier with one or the other. Probably the best coffee I had all week finished out the meal. The following night found us in Biloxi, MS. We'd seen recommendations for Mary Mahoney's but after two days of fancy, we wanted a little lighter. We ended up at Half Shell Oyster House, for very good (if unphotographed) food. A "cajun bloody mary" had a nice balance of spice with a sweet little oyster. Voodoo Shrimp appetizer was nicely fried shrimp with a sweet/spicy sauce -- tasty but probably not worth getting again. I had the Redfish Orleans, blackened and topped with shrimp and crab. Thankfully it wasn't traditional blackening to the point of drying out, more of a spicy butter saute, quite delicious. Sue had the Filet Orleans, perfectly medium rare and topped with shrimp. So we didn't end up with a light meal, but at least it was more casual and significantly cheaper than the night before. The following day was the best weather we had, approaching 80 on the coast. We visited the Mississippi Sandhill Crane Refuge (didn't see any cranes but lots of carnivorous plants) and a quick stop on a beach on Perdido Key just into Florida. So as night approached we decided to dine in Panama City Beach. The Wicked Wheel came up favorable in reviews so we stopped there. It sounded kitschy, but came across as a very commercial motorcycle-themed resto. Food was just fine, but nothing special. 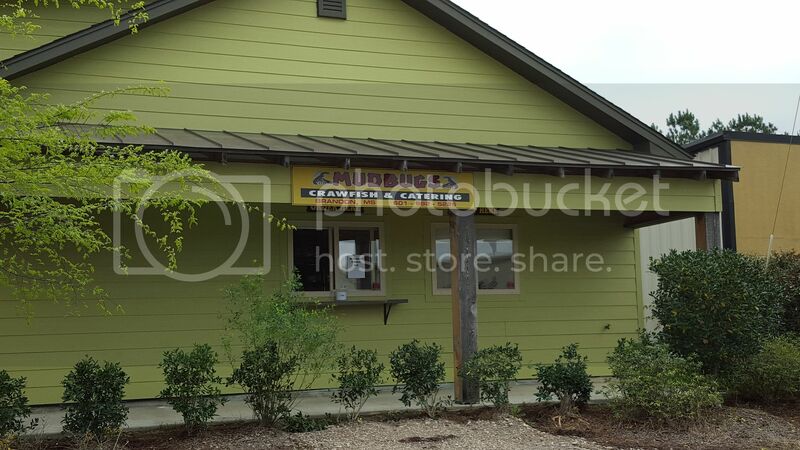 I had fried catfish, one of their specialties; Sue had fried shrimp. For me the highlight was the collards as a "sidecar." I have to make another post about getting sealed tubs of salad dressing. The next day found us at our southeast-most point: Wakulla Springs in Florida, then started back north, ending in Dothan AB. Our hotel was right across the street from a BBQ place that had horrendous reviews, so we tried Rodeo Mexican Restaurant. I'd call it perfectly adequate Norteño. No threat to El Nuevo Leon, but significantly better than Chi-Chi's. Sue had chicken and steak flautas, I had a combo featuring a ground beef chile relleno, a quesadilla and steak taquito. The steak and chicken were much better than their ground beef. I'd have liked a zingier salsa. Cheapest dinner of the week: $20 with a generous tip. The weather finally started catching up to us by the next night: we got to Nashville in a drizzle, driving dark narrow roads to get to Loveless Cafe (and even darker, narrower and rainier to get to our hotel). Feeling like we've been stuffing ourselves all week, we ordered one combo platter (ham, fried chicken and pulled pork, sides of mac 'n' cheese and hash brown casserole), plus a large salad and an extra side of fried okra (one of my weaknesses). Great biscuits with house-made jams, perfect fried chicken (not "Nashville Hot"), decent pulled pork, and I even liked the country ham (I am generally not a fan of any but the long-cured hams such as Iberico and prosciutto). Our last night was in Indianapolis, partly to visit a friend from gradeschool and a cousin. After searching here and elsewhere (and not wanting to dine al trunko or in the back of a supermarket), we decided on Pioneer in the supposedly-hipster Fountain Square (no hipsters seen, a few folks in steampunk gear coming out of the duckpin bowling place). I was surprised we were able to walk in and get a table at 7:15 on a Saturday, but my buddy Bill says, "that's Indy for you." Food was outstanding. "Alpine" small plates with a couple of larger entrees. 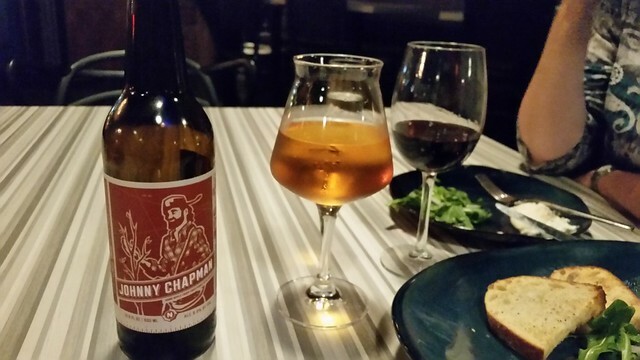 The cider was a local: New Day Craft Johnny Chapman. Not my favorite: too sweet, with a very strong fermented apple flavor. I don't recall what wine Sue had. 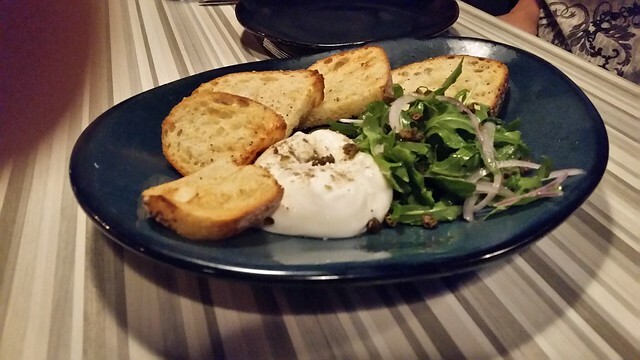 We had four plates: Burrata was served with a crisp herby toast, creamy and just right balanced with the slivered onion, fried capers and arugula. 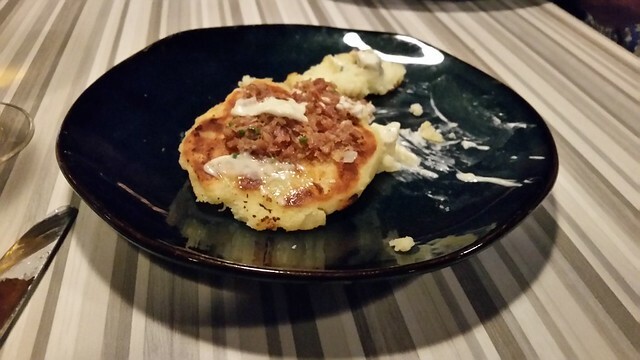 Potato cakes are not my grandma's potato pancakes, more of a fried smashed potato, served with (not enough) mustard creme fraiche and a bacon jam (that was more like a bacon rillette -- not sweet). I liked these a lot. The Gnocchi with Lamb Ragu and Ricotta was terrific. We dug into it and forgot to photograph. I was hoping for more gamy lambiness, but the right balance of sauce to crisped little gnocchi. 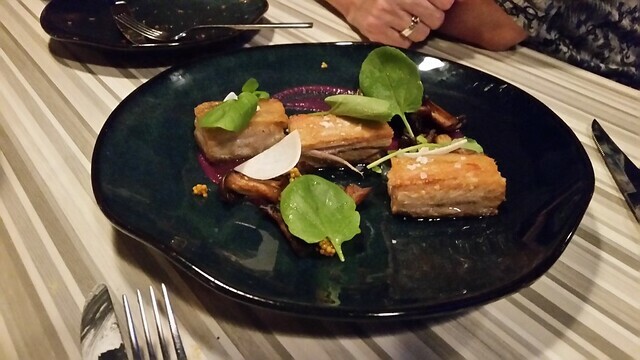 Mustard-braised pork belly was perfect: Crisp on top and soft below. Served with pureed red cabbage and oyster mushrooms. The next day, we met my cousin for brunch at 20 in the Charley Creek Inn in Wabash, IN. Not an elaborate brunch, just ordering off the menu. Sue had eggs benedict, I had an omelet. Good coffee. Reasonable prices. Leaving at 1 a.m. last Friday night I knew Jackson, MS was going to be our first stop for lunch on Sat.after driving through the night - a quick 11 hour cruise - research had shown the folks in this town dig crawfish - so do I.
my plate - 1# of the finest bugs around, 1# of snow crab, 1 link of sausage: - bumper crop of bugs this year - cheap prices and tasty bugs. Last edited by jimswside on May 2nd, 2016, 8:10 am, edited 1 time in total. Great info in here . . . I keep coming back to Joel's post . . .but Jim, I feel like you're holding back some . . . I want more! Sounds like a great trip. JoelF wrote: I don't know if you'll ever have a reason to go to Jackson, but if you do, seek out Manship. So both your suggestion and Jim's are on the dining list. Here’s a recap of our Jackson trip. Verdict on the Amtrak sleeper car, expensive & time consuming, better spent on a more scenic route if spending the money & time. Also, bring earplugs as most townships in the U.S. don’t have a cease whistle order like Chicago & Des Plaines, so that train horn is blowing almost the entire trip. The national military park in Vicksburg was outstanding, well worth the time. Upon arrival into Jackson, we picked up our Enterprise rental car and immediately drove to Beatty Street Grocery. I had a fried bologna sandwich and the smokey link. Both were top notch delicious. Mrs Willie had a roast beef po’ boy, a good sandwich no doubt. All three were quite tasty, I personally give the nod to the tamales, followed by the pork belly. I thought the lamb ribs while tasty were overcooked so lamb flavor wasn’t as pronounced as I would have liked, the Asian slaw was a wonderful way to clear the palette before another bite of lamb. We then split a main stay of entrees: REDFISH ANNA WITH LUMP CRAB MEAT w/ GARLIC MASHED POTATOES, THIN BEANS, CHARRED TOMATO LEMON BUTTER. Wow, what a dish, while yes mashed potatoes are a bit pedestrian, the dish was still excellent both in taste & execution. Fish cooked perfectly & full of flavor, uber fresh lumped crab meat. Did stop by Drago’s for some grilled oysters, friggin amazing, these guys do it right. Had dinner with a client and he wanted to go to Char, the local steakhouse. The NY Strip I had was indeed delicious. Sweet Willie wrote: The national military park in Vicksburg was outstanding, well worth the time. Speaking of Vicksburg, we were ready for a late lunch after the Military Park tour, so went to 10 South Rooftop Bar & Grill. The food was ok (my fried green tomatoes with crawfish sauce was not too shabby) but the views from this place are amazing, well worth your time to go up for at least a drink and overlook the river as this restaurant/bar is 10 floors high with stunning views of the Mississippi & surrounding area. 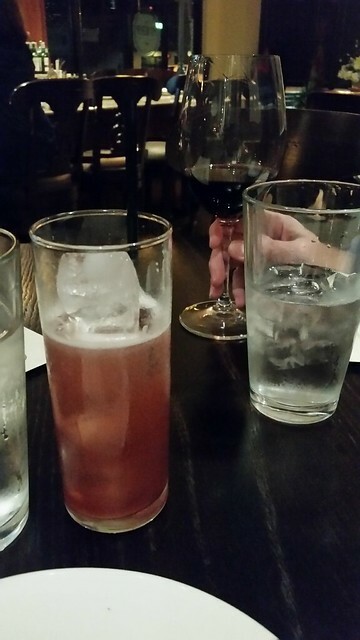 Prior to 10 South Rooftop, we stopped by Walnut Hills Restaurant which is housed in a terrific old home. It was a Sunday so there was a fixed menu of southern fried chicken & other good looking items but Mrs Willie wasn't up for it so we left. The bar area looked like it had a fantastic vibe. Sorry we missed trying a few on our trip, next time!